Peacefully located beside a marina on the banks of the Derwent River, the Waterfront Lodge is only minutes from the Hobart CBD, Battery Point, Salamanca Place, Sullivans Cove & Wrest Point Casino. 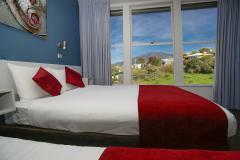 It is an ideal point to base yourself for exploring southern Tasmania’s tourist attractions. Waterfront Lodge provides well-equipped motel rooms with private ensuites, televisions and tea/coffee facilities.